This week, we had a 2018 Toyota Prius C Four in our test fleet. It had been a while since I'd driven the C, but remember liking it more than the standard Prius — at least that was true a generation ago. Since then I've driven updated Priuses and Prius Primes. So when the C arrived, I snatched the keys and drove it home — a 40-mile commute through city streets, rush-hour highway traffic and a little stretch of curvy roads to top it off. I was eager to try to remember why my vague memory of the car was positive, and if it would remain so. 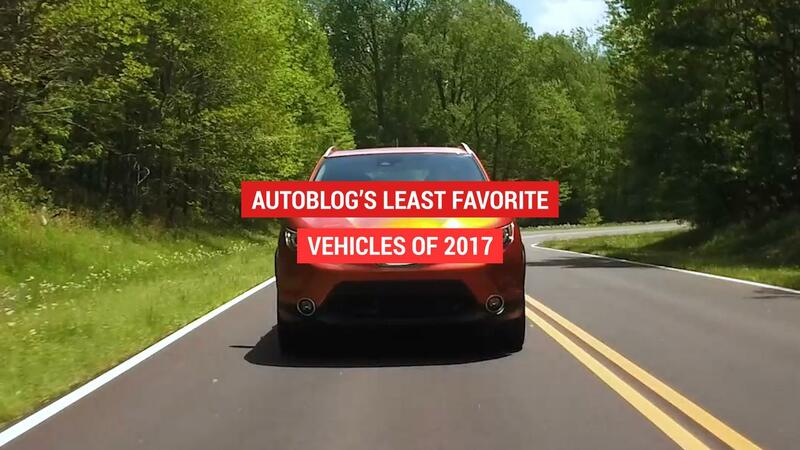 Heading down the parking lot, I had no trouble spotting the Prius C with its bulbous, bright orange nose poking out from between other, more subdued hues of neighboring vehicles. I was pleased to see that its paint — Tangerine Splash Pearl — nearly matched the Orange Fury of the 2018 Ford Mustang we recently welcomed to our long-term garage. So far, so good. Heading onto Woodward, I had no trouble getting across the crowded lanes. 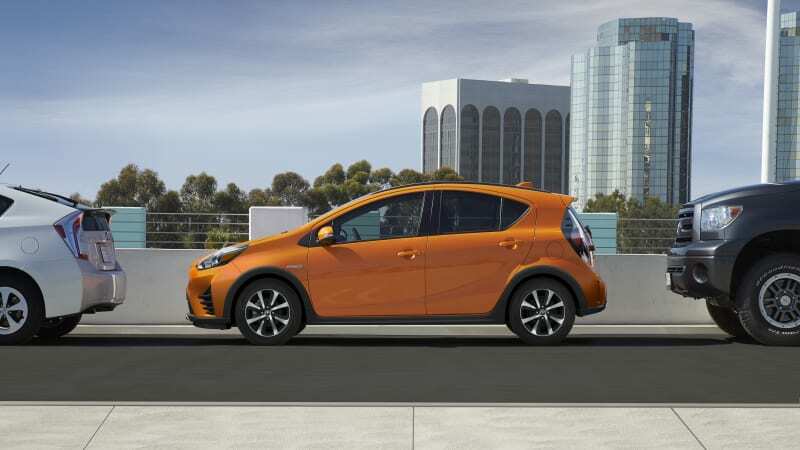 The Prius C isn't quick, but it's small and easy to fit through gaps in the traffic. It also has decent visibility, so a quick look over my shoulder allowed me the confidence to move across the lanes, one by one. Getting up to the 45-mile-per-hour speed limit saw me standing on the right pedal, the revs held high as it droned its way up to speed. 45 miles per hour feels a lot faster when you're bouncing over potholes with the accelerator pinned to the floor. On the highway, I flogged the hell out of this poor little Prius. I probably could have driven it a lot more gently to get it up to speed, but screw that! How often do you get to completely and safely push a car as hard as it can possibly go on public roads? I wasn't going to bother worrying about saving fuel. As it turns out, the Prius C still managed to be efficient, despite my best efforts to thwart it. I was surprised to see the average fuel economy for the trip hover just shy of 40 mpg, not too far off its 43-mpg highway rating. When I got home, the fuel gauge still showed a full tank. My 2½-year-old son was already in the driveway, eager to check out my "cool orange car." We sat in the front, we sat in the back, opened the doors, closed them and repeated that until I convinced him it was time to go inside and eat. I took the time to scope out the interior, which feels much more natural than the polished plastics of the other Priuses I've driven of late. It might not be as funky, and that's fine with me. The back seat, while sporting decent legroom, was really low on headroom. I was glad I didn't have to spend a ton of time back there. In the morning, I awoke to a spring downpour. That's fine, I already had my fun with the Prius C on the way home, and my morning commute is often a bit slower. I put on a podcast, hit the Eco button, and enjoyed the rainy drive to work. When I got off the highway with about eight miles left to drive, I was surprised to see that the average fuel economy for that trip was over 55 mpg. By the end of the trip, it was near 54 mpg. The fuel gauge still read full. I came away from the Prius C with a renewed enthusiasm for it. It's small, buzzy and slow, and the steering is especially numb. Despite that, I was able to have a lot of fun with it. Caning as hard as possible while flicking it through traffic was kind of a riot. It was a challenge to try to quickly build and maintain high speeds, but despite its small footprint, it was stable and calm on the highway as long as I was. The fact that I could drive it like that and still effortlessly achieve excellent fuel economy was probably the most satisfying part, though.